Building a Mini-Max - Team Mini-Max, The World's Best Ultralight and Light Plane Kits and Plans. So... think you can build an aircraft? Of course you can! All the aircraft in our Mini-Max line are designed to be built by guys (and gals) with average skills, using simple hand tools. 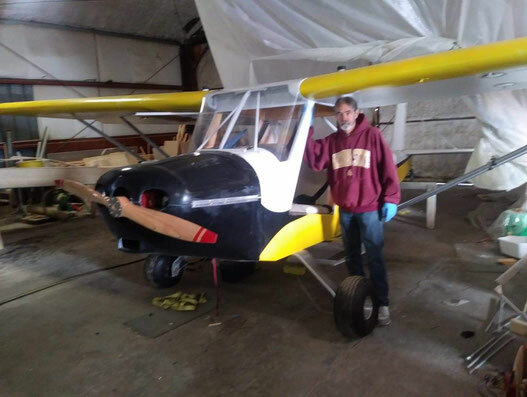 There are no extremely difficult tasks; just many simple steps that you do, one at a time until you have the finished aircraft. Unlike complicated metal or composite kits, you won't need to spend thousands of hours in the shop. You can build a Mini-Max in just a few hundred hours, and our new AeroMax quick-build kit with it's laser-cut and marked parts will go together even faster. The following is a very brief overview of the tools and steps required. Please carefully read the plans and builder's manual. Take a lot of photos of your build process. These will be needed for the final inspection. Please contact your local EAA Technical Adviser for advice and periodic work-in-progress inspections. Your shop should be clean and organized. Ideally we recommend a hangar or 2-car garage, but plenty of Mini-Maxs have been built in single garages. One was built by a woman in an upstairs apartment! 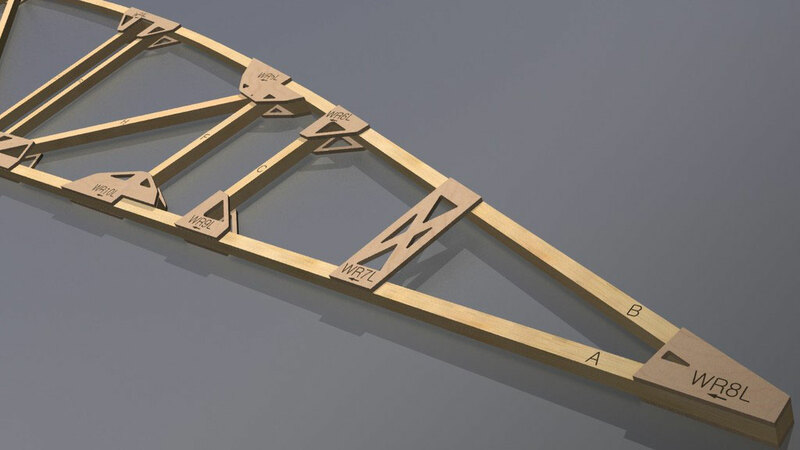 All the major airframe components will fit through a standard doorway. The ribs can be built on any flat surface at least 5' wide. One of our customers had to do a lot of business travel, so he took his rib kit on the road and built one rib each night in his hotel room. You'll need a very sturdy, very flat workbench 3' x 14' or 4' x 16'. A good material for the top surface is 3/4" MDF (Medium-density fiberboard), available at most building supply stores. MDF is harder and flatter than traditional plywood. The workbench should have a flat straightedge (preferably metal) clamped or screwed down in the back. 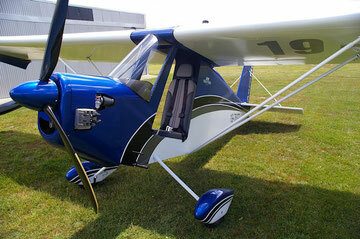 There are some simple plans for an aircraft assembly workbench in the January 2010 issue of Sport Aviation magazine. Their design is a little shorter than we need, but you can scale the dimensions up. They also have an clever idea for retractable casters, so you can move the heavy workbenches around your shop. The Mini-Max was purposely designed to be built using a few simple hand tools and supplies: a small miter box and saw, dixie cups, wooden stir sticks, acid brushes, wax paper, and lacquer thinner for cleaning parts and tools. A lot of cheap spring clamps are needed (you can't have too many clamps!) and a small digital scale is very handy for measuring precise amounts of T-88 epoxy. The one power tool we strongly recommend is a small bench sander. This will save a lot of time fitting parts together. If you have a drill press and/or band saw they'll come in handy, but aren't required. Some builders start their projects building wing ribs. 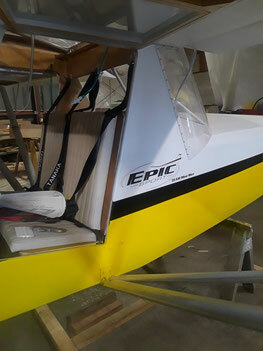 Others start with the empennage (fin, rudder, horizontal stabilizer and elevator). First you cut the parts to shape (the AeroMax parts are pre-cut and marked) then you check the fit, apply adhesive, assemble and clamp. T-88 epoxy takes about 24 hours to fully cure, depending on the temperature. When the empennage components are complete you can begin the covering process or wait until all the airframe components are finished. The first thing you do in wing construction is build the ribs. Each wing has 8 or 9 ribs and there are left and right hand versions. 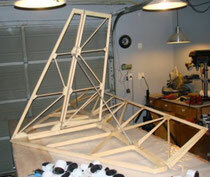 The ribs are constructed from 1/4” square stock parts joined with thin plywood gussets and T-88 epoxy. The traditional method of rib construction is to build them on the plans, over wax paper, with staples temporarily holding the parts together while the epoxy cures. Team Mini-Max has a new rib assembly fixture that simplifies assembly process and ensures very precise rib construction. You can buy the fixture from us, then when you're done building ribs, we'll “buy” it back for the same price, minus the cost of damaged parts. The spars are built and the ribs assembled to the spars. The internal drag and anti-drag braces are installed and the molded fuel tanks. You might notice the ailerons are part of the wing ribs. 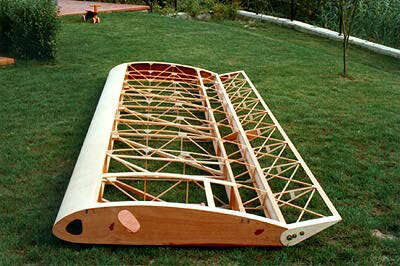 After the aileron spars are added each rib is cut so the aileron becomes a separate component. Nose ribs are added and the wing hardware. 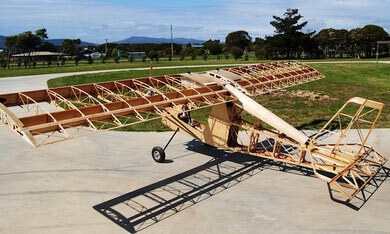 After the plywood leading is installed the wings are almost complete. 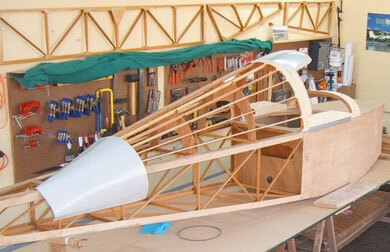 The two fuselage sides are built flat on the workbench. When the epoxy has cured they're turned upright and fastened together with cross braces, gussets and T-88. The bulkheads, seat and turtledeck are added, and the landing gear. This major milestone is commemorated when the pilot sits in his fuselage and makes airplane noises! Next the controls (joystick and rudder pedals) are added. Assuming an engine type has been chosen, the engine mount, engine and avionics are installed. The final parts fitted on the fuselage are the cowling and windshield. It's very important that all wood parts are thoroughly coated with varnish. A spray gun works best to get into every “nook and cranny”. For a covering process we like the Stits Poly Fiber system, but there are other excellent choices. The most important thing is to carefully follow the manufacturer's instructions and don't mix different systems. The fabric is glued to the wood structure and tightened with the heat of a calibrated clothing iron. Then various coats of fabric sealer, UV blocker and paint are applied. A builder can get very creative with his or her paint schemes, but complex designs can add a lot of weight. Transporting the aircraft for final assembly is another major milestone, and you can expect a curious crowd of men, women, children and dogs to be watching the process. The main components are assembled and squared up and the controls are connected. You'll definitely want your EAA Technical Representative to inspect the aircraft before the final inspection by the FAA Designated Airworthiness Representative (DAR). If your aircraft passes this inspection you will be issued an airworthiness certificate. This is an enormous accomplishment – to have built your own aircraft!